SCOTUSblog is an “impartial, journalistic entity” which provides comprehensive coverage of the United States Supreme Court (“SCOTUS”). Founded in 2002 by attorneys Tom Goldstein and Amy Howe, the blog reports on every merits case before the Court at three different stages: prior to argument, after argument, and after the decision. The blog also provides coverage of all significant petitions of certiorari. Attempting to “avoid any appearance of bias and favoritism,” the blog maintains certain policies to ensure that its articles are objective. However, SCOTUSblog goes beyond the coverage of individual cases. Each day, it provides a “Round-Up” of what has been written about the Court in a particular day. It also provides “Special Features,” “Statistics,” “Videos,” and much more. In terms of case law, SCOTUSblog provides an individual page per case. For example, in the case of Padilla v. Commonwealth of Kentucky, visitors can find a brief “Holding” and “Judgment” of the case followed by “SCOTUSblog Coverage” which includes pieces written about the case within the blog itself. Additionally, visitors can find “Briefs” (both parties’ briefs and amicus briefs), and “Other Documents.” Those other documents include articles and blogs from other media sites such as NPR, the New York Times, CNN, the Huffington Post, Bloomberg, and many others. The number of briefs and other documents varies depending on how recent a case is. Underneath SCOTUSblog’s logo readers can find several indices [“Merits Cases,” “Petitions,” “Statistics,” “Special Features,” “Plain English,” “Videos,” “Resources,” and “Administration”] that provide easy access to specific pages. For readers who are just getting acquainted with SCOTUS’s Justices and the work SCOTUS does, a wonderful index to start with is “Plain English.” Within that index, readers can find Supreme Court Procedure which follows an imaginary Supreme Court case through the judicial process. Additionally, readers can find a Glossary of Legal Terms and Biographies of the Justices. In terms of the organization of the posts themselves, SCOTUSblog has the best of all worlds. On the left side of the homepage visitors can find, as they scroll down, the latest posts in the order in which they are written. On the right side underneath “Featured Posts,” visitors can find posts of special interest ranging from argument previews, breaking news, and in-depth coverage of SCOTUS. This makes it easier for visitors to find important pieces that otherwise would end up buried among the countless posts written on a daily basis. And underneath “Featured Posts,” visitors can find “Merits Cases Pages and Archives” which allows readers to retrieve everything SCOTUSblog has published, and all the materials it has collected, on every case, since 2005. Underneath “Merits Cases Pages and Archives,” readers can find “Term Snapshot” which highlights everything that is going on in the current Term. Readers can use this section by visiting the several topics within it, including: This Week at the Court, Major Cases, Upcoming Petitions, and Recent Special Features. And readers who are visual learners can visit the “Calendar” [found underneath “Term Snapshot”] which breaks down Orders/Opinions, Arguments, Conferences, Events, and Holidays with different colors and a visual calendar for easier access. While all of these features, with the exception of the latest posts, can be found within the homepage, they remain in any page visited thereafter. For example, if visitors go to the “Videos” index, they will have access to all the videos while also being able to see all the features from “Featured Posts” to the “Calendar” on the right side of the page. In addition to all these features, SCOTUSblog also has a search bar at the top right corner of the webpage which makes the blog even more accessible. By typing key words such as “Immigration Collateral Consequences” or a case name such as “Chaidez v. United States,” readers can find all sorts of information that is not readily available right in the homepage. Underneath the search box, visitors can find two links: “Blog” and “Docket.” The “Blog” link will keep readers within the SCOTUSblog itself, while “Docket” will send visitors to the official SCOTUS website. Lastly, SCOTUSblog is made even more accessible to its visitors by including a “Twitter Feed” [@SCOTUSblog] within its “Term Snapshot” section. Additionally, readers can provide their email in the “Email Digest Sign-Up” to receive a daily email digest from FeedBurner without even visiting the blog. Moreover, visitors can have current access to the material posted in the blog by using the blog’s RSS feed. 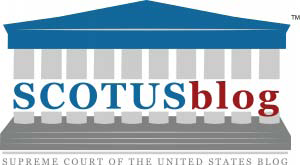 And with current technology, SCOTUSblog has taken its accessibility to the next level by including a “Switch to mobile site” link at the very end of its webpage which makes the blog extremely accessible to readers with Androids and other mobile devices. From case law to interactive videos, SCOTUSblog provides readers easy, current, and comprehensive access to everything related to SCOTUS with the simple click of a button.